Bomin Moor Granite- Was Brenton Symons right? 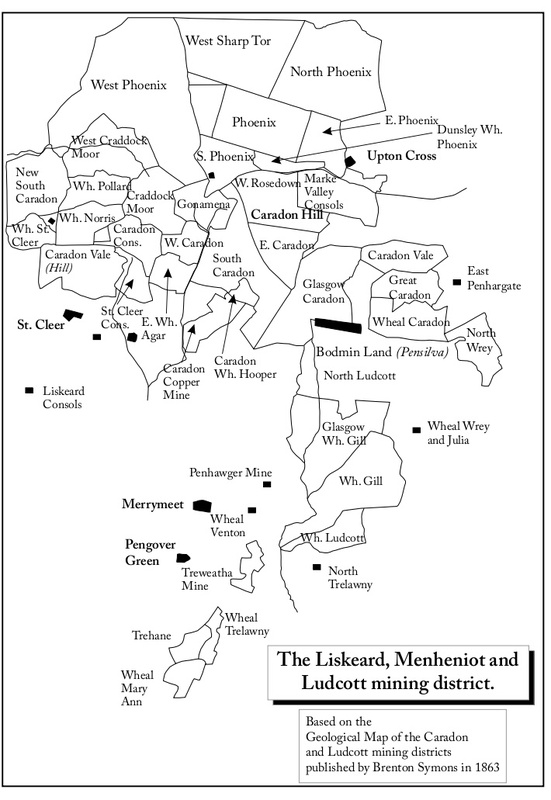 In the previous posts I identified that the Liskeard 1863 Geological map of the Caradon Hill area and the modern British Geological Survey disagreed on the location of the granite/killas boundary. So which one was right? I hoped it was Brenton Symons Victorian map, for no other reason that it appeared more detailed. However, with a bit of digging in some of the books on the shelves I managed to discover which map was best. This statement coincides with the course of the contact shown on the modern map. It is rather strange that Symons was in error within such a well mined sett as South Caradon, and even stranger that he was in disagreement with Webb and Geach, considering their book and his map were believed to be have been produced in association with each other. 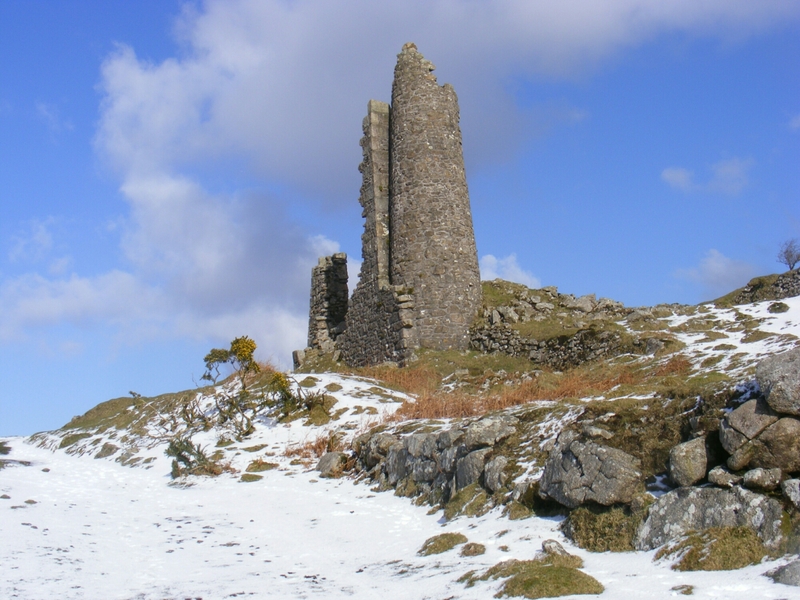 The whole of the sett is in killas, which overlays the granite at about an angle of 45°, and the junction occurring at the northern boundary, the engine shaft at the 54 comes into granite, its contact with the slate being well-defined, no decomposition having taken place. It should be noticed that two elvan courses of felspatic granite run parallel to the lodes. So far then, my hopes for Brenton Symon’s work being more accurate had been proven incorrect. The next mine to be looked at was second most important one on the map, Phoenix United. Dines presented an excellent resource to disentangle the complex geology here, nice cross section of workings on the main lode. Part of this diagram is shown here (Copyright BGS). The plan show the lode running west to east. My annotated yellow line is the granite/Killas contact. Killas to the right, granite to the left. It is indicated reaching the surface close east of West’s Shaft. The conclusion from this fact is that again the Modern map is more accurate. The dotted yellow line is the Great cross-course, more on that feature in the next post. 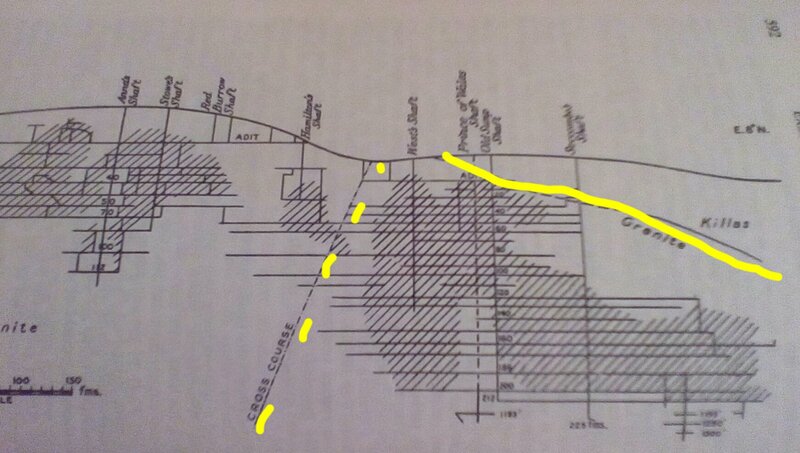 The final mine I studied in detail was South Phoenix. Brenton Symons shows that sett within granite, and yet the British Geological Survey clearly show a large slab of killas intruding between two faults as far west at the Hurlers. Again Dines contained a diagram that provided an answer. This cross section runs north to south across the South Phoenix Sett. 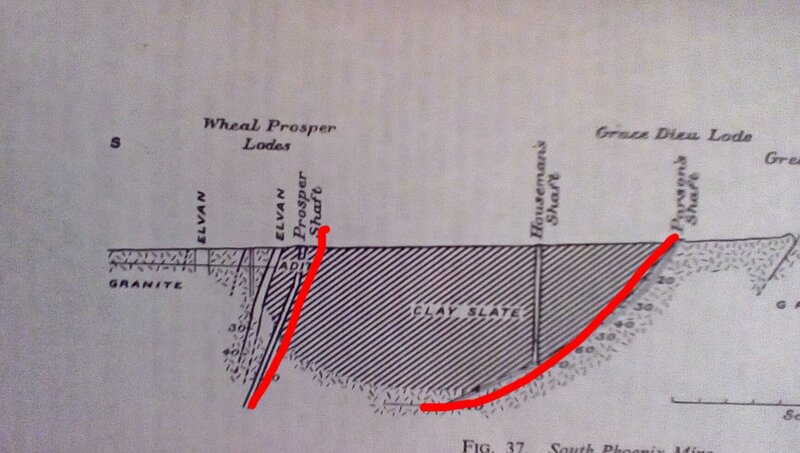 It clearly shows the ground between Prosper Shaft and Parson’s Shaft being ‘clay slate’. An indication that yet again the modern map is more accurate. Despite of my desire to prove the superiority of the Victorian cartography, when it came to depicting the granite/killas contact the modern map was clearly superior. Next round would be the cross-courses, or faults. Webb and Geach’s book is available in paperback. I found the history of the Pheonix United Mine of great interest. Often taken as a child by parents and grandparents to the area. Where my late father Sir Vernon Seccombe of Saltash often mentioned the family connections to the mining industry.